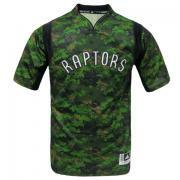 The pro basketball Toronto Raptors arrived just in time for Military Sunday, the Stupor Bowl where this Sunday once again Americans will honour those brave men and women who are keeping them safe and out of harm’s way.. There they were 2 nights ago,the Raps, dressed up in military camouflage gear for the 7th straight homage to the men and women of the Canadian Forces..
What a crock.The most violent terrorists in the Middle East have been the American forces in Iraq and Afghanistan And Canada one step behind. And who knew? Since I do not follow basketball I had no idea that this militarism had leached its way into our Canadian culture.I just caught the camouflage clip on the sports news. Maybe the Leafs should be suiting up as well.Oh yeah, I forgot they salute troops before every game. How about teachers, social workers,nurses etc? Maybe the Raptors should show that awful movie hymn to violence The Sniper before the next game. What a trifecta.Drive along The Highway of Heroes which used to be called the 401, catch the Sniper film, a hosannah to a psychopath and then cheer on the boys in camouflage.